Carfentanil, a drug used to tranquilize elephants, is posing a strong danger in New Hampshire. Police in Manchester, New Hampshire, are looking for a man believed to be in possession of a powerful synthetic drug that has recently surfaced in the state. Police and federal agents searched the home of Preston Thorpe, 24, on Thursday, but believe he is gone. They said they found a trace amount of carfentanil in the kitchen, along with a small amount of marijuana. 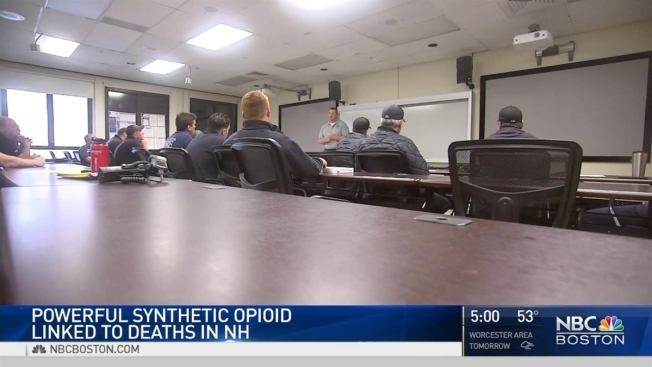 State officials said last week that carfentanil was confirmed to be in New Hampshire, and it was linked to three overdose deaths. No arrests have been made in connection to the deaths. The drug was created to tranquilize large animals such as elephants. Officials said it's 100 times more potent than fentanyl and 5,000 times stronger than heroin. A nationwide extraditable arrest warrant charging Thorpe, aka "P", with possession of carfentanil was issued. Police said he's originally from California. He is described as 6'3" tall, 210 pounds, with brown hair and brown eyes. He has a sleeve-style tattoo on his right arm and hand and a large tattoo on his left forearm. Investigators believe he may be operating a newer model Audi A4 2.0 T bearing a New Hampshire temporary dealer registration number of 2089050. The car has a Team Nissan, Manchester, NH decal over the A4. He also had a 2011 Mitsubishi Lancer registered to him, but it is unknown if he still owns the vehicle. Thorpe also may be traveling with a woman, Ashley Arbogast, 28, of Manchester. She is described as 5'1", 156 pounds, with brown hair and brown eyes. She has tattoos on her left arm and hand. Anyone with information on Thorpe's whereabouts is asked to call Manchester Police at 603-668-8711 or Manchester Crimeline at 603-624-4040.